From left: Mary Timony, Laura Harris, and Betsy Wright of Ex Hex. Throughout her long career, guitar hero and singer Mary Timony has often seemed like the wayward child of another time. In her days fronting Boston college-radio darling Helium as well as later solo outings, she often channeled a cross between Hildegard von Bingen and Chrissie Hynde, as likely to turn out a medieval drinking song or progressive punk headspin as anything else. 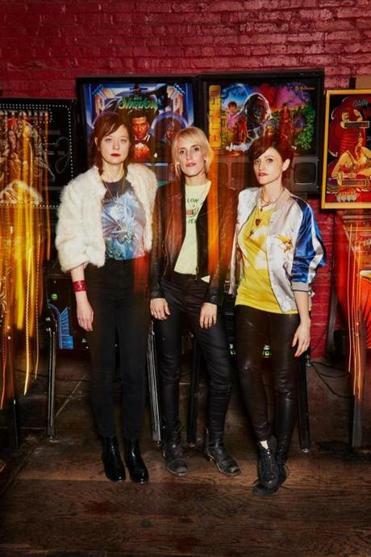 Most recently, she’s been playing alongside guitarist/bassist/singer Betsy Wright and drummer Laura Harris in Washington D.C; by their powers combined, they are Ex Hex, and they love rock ’n’ roll. Debut album “Rips” blasted off in 2014, handing down a tight stack of garage-pop nuggets. “It’s Real,” out Friday on Merge Records, sees the band pushing those bounds a bit. Speaking with The Fader in January when the album was announced, Timony and Wright mentioned taking a more experimental and collaborative approach toward crafting “It’s Real,” playing around with broader arrays and deeper layers of effects. The difference is noticeable: “Rips” splashed down with a tight, punchy burst of bright color, the guitar sound compact. “It’s Real” paints with a greater variety of tints and shades. So blast it loud and blast it proud. This is a summer album. It’s as colorful and sweet-tart as a cone melting in the sun, rolled in crunchies and glitter. (Is it any wonder that the Washington, D.C., outpost of Mount Desert Ice Cream named a flavor in the band’s honor?) If it’s not summer when you’re listening, these songs create their own summer of the mind. From the driving call and response of “Tough Enough” to the dazed stroll of “Medley” and the flange-wrapped pogoing of “Cosmic Cave,” these songs invite you to move your body: strutting down the street, in a car with the windows down, cruising on your bike, or just bopping your head along waiting for the bus. Those who were wishing for more consciously brainy, ethereal art-pop or mad science won’t find it here. There’s little that’s wholly new on “It’s Real,” and there’s nothing wrong with that. To say it another way: Put another dime in the jukebox, baby.